NEW ORLEANS – The collegiate record book, NCAA Division II record book, NCAA Division III record book and every Descending Order List wasn’t safe this past weekend. We saw a number of outstanding performances and our picks for National Athlete of the Week stood out the most. 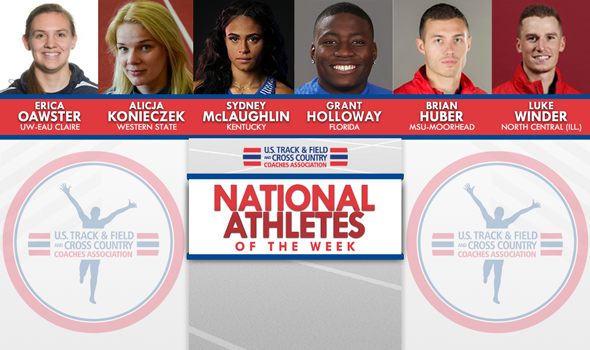 This is the final batch of National Athletes of the Week for the 2018 outdoor season. Grant Holloway went super saiyan this past weekend at the SEC Championships. Holloway opened competition on Friday with an incredible series in the long jump. He soared 8.17m (26-9¾) on his first attempt to take the lead and then answered with a wind-aided leap of 8.32m (27-3¾) on his fifth and final attempt to claim the top spot once again. That also put him second on the all-conditions collegiate list this season. Two days later, the sophomore sensation returned to Tom Black Track at Laporte Stadium and dominated the final of the 110 hurdles. He clocked the fastest collegiate time since 1979 (13.15) and moved into sole possession of second place on the all-time collegiate chart. Holloway also took the baton third on the third-place 4×100 relay and anchored the 4×400 relay to cement Florida’s first SEC outdoor title since 2015. This is the second National Athlete of the Week honor for Holloway this outdoor season. He also earned the award back on April 17. Sydney McLaughlin broke the collegiate record and lowered her own world junior record in the 400 hurdles this past weekend at the SEC Championships, two weeks after she clocked the fourth fastest time in collegiate history. McLaughlin made it look easy, too. She breezed around the track in 52.75 – which shattered Kori Carter’s standard from 2013 by 0.46 seconds – and won by more than three seconds. If McLaughlin sheds that much time off her PR in a few weeks, she’d set the world record. Yes, the world record. Yuliya Pechonkina is the current owner of that all-time mark at 52.34 seconds. Later in the meet, McLaughlin split 50.08 on the third leg of Kentucky’s 4×400 relay. That is now the 11th fastest time in collegiate outdoor history. This is the second National Athlete of the Week honor for McLaughlin this outdoor season. McLaughlin also brought it home on April 3. Brian Huber hit the top long jump mark in NCAA Division II this season at the Northern Sun Intercollegiate Conference Championships. The senior posted an NCAA Division II Automatic Qualifying Mark of 7.91m (25-11½), putting his mark a half an inch ahead of the previous season best. Huber also hit a Provisional Mark in the 200 with a time of 21.38 for a runner-up finish at the NSIC Championships. The native of Staples, Minnesota, becomes the first male athlete from MSU-Moorhead to win a National Athlete of the Week honor in any of the three sports the USTFCCCA recognizes. He joins Molly Montonye (Sept. 14, 2015 during the cross country season) as the only athletes from MSU-Moorhead to earn National Athlete of the Week honors. Alicja Konieczek made her season-debut in the steeplechase, and did so in a big way. At the Oxy Invitational, the redshirt-junior notched an NCAA Division II-leading time of 9:57.14 that doubles as an Automatic Qualifying Mark in the event. Her time also sits eighth in NCAA Division II history. The product out of Zbaszyn, Poland, was also the National Athlete of the Week during the outdoor season on May 9, 2017. She is the only female athlete from the Mountaineers’ program to pick up the honor. Luke Winder loves putting on a show for the home crowd. This past weekend at the Dr. Keeler Meet, which is the penultimate time he’ll compete inside Denedetti-Wehrli Stadium, Winder bettered his NCAA DIII all-time best in the pole vault to 5.60m (18-4½). That clearance came on his final attempt at the height. Winder previously established the NCAA DIII record last year at the Gregory Final Qualifier, which is the final regular season meet hosted by North Central (Ill.) each year. The senior from Joilet, Illinois, will get two more cracks at pushing the bar even higher. One will come this weekend at the Gregory Final Qualifier once again and then the following weekend at the NCAA meet in La Crosse, Wisconsin, where he’ll look to become the sixth four-time outdoor individual champ in NCAA DIII history. This is the second time that Winder has been named National Athlete of the Week this outdoor season. Winder also earned the honor on April 3. Erica Oawster couldn’t have picked a better time to surge to the top of the NCAA DIII Descending Order List. This past weekend at the Eagle Open at UW-La Crosse, Oawster flung the discus 49.85m (163-6) to take over the top spot nationally with two weeks remaining until the NCAA meet. That left her just a few inches short of the NCAA DIII all-time chart in the event. Oawster is also ranked second nationally in the shot put with a heave of 15.11m (49-7). This is the first time an athlete from UW-Eau Claire has been named National Athlete of the Week during the outdoor season, regardless of gender.